The rainy season is officially here ladies. While that might be great for May flowers, it can be a disaster for our hair and makeup. A heavy rain day can ruin a perfect hair and makeup day in a matter of seconds. So having water-resistant products on hand can be a lifesaver in avoiding black tears and frizzy hair. Here are a few of my favorite products and tips to help you brighten up even the cloudiest of days. Your makeup application should always begin with a good primer, especially during inclement weather. This will help your prep your skin and create a better surface for your makeup to adhere to. When rain is in the forecast, less is more. Go for a more natural look use a tinted moisturizer instead of a heavy foundation. Avoiding black tears from streaming down your face is easy. Simply use a waterproof mascara and eyeliner to keep your lashes intact and make your eyes pop, before stepping out in the rain. Cream blushes have staying powder and are less likely to streak when wet. Wrangling rainy hair is the worst. A messy bun or top knot is an incredibly easy way to combat humidity-hair. Use screw pins to keep it up all day. Hair tends to get frizzy in the rain. To smooth it out use an anti-frizz serum to tame unruly hair. For a wet humid day, you want a lip product that won’t budge and packs a punch. Pick a tint or lipstick that won’t smear and last you all day. Lock your makeup in place with a setting spray. 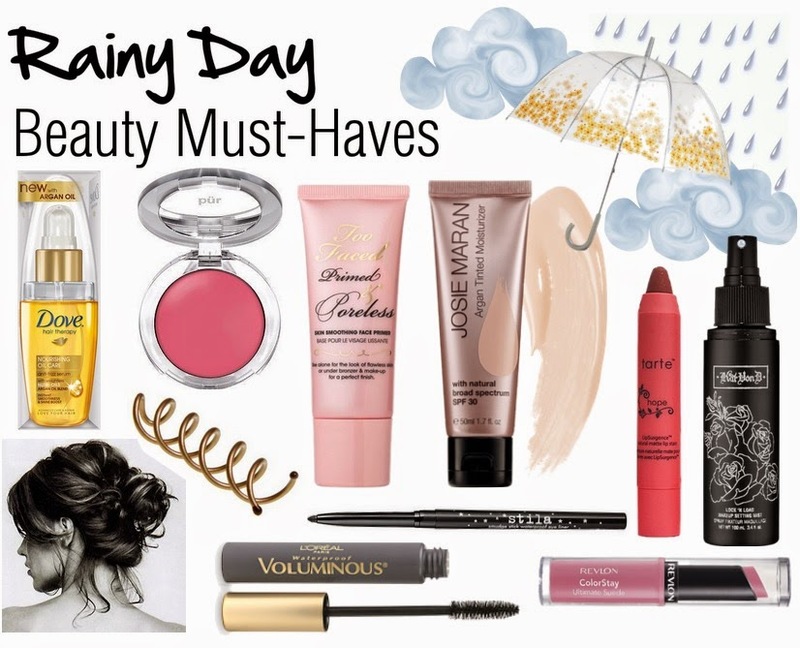 It will help you extend the wear of the makeup even on the rainiest of days.